'If India employs a strategy of a 'thousand cuts', Pakistan will wither away even without a nuclear war,' says Colonel Anil A Athale (retd). The Indian government has asked Pakistan to act against the Jaish-e-Mohammed in a time bound manner if it wants relations to improve and dialogue to continue. If Pakistan complies, it will establish its bonafides and the crisis can be resolved. But given the mindset and prevalence of conspiracy theorists in that country, it seems very difficult, if not impossible. But having given peace a chance, India has bought some extra time before it thinks of other measures. But the 'good news' first. The terrorists failed to reach the technical area of the Pathankot airbase where aircraft were parked. Imagine a situation if they had destroyed many fighter aircraft, blown up the ammunition and fuel dump and killed a large number of air force personnel. India would have been forced to launch a retaliatory attack, the pressure of public opinion would have been so strong. This would have certainly provoked a Pakistani response, the make believe in that country being such that nobody there would have believed that it was Pakistani provocation that started it all. If the May 1998 nuclear tests by the two countries are a guide, then there is every chance that the 'competitive retaliation' could have quickly degenerated into an all out conventional conflict and the possible use of nuclear weapons. Pakistan, India and the world is lucky that this did not happen. During the December 13, 2001 attack on Parliament, it was the presence of mind of the watch and ward staff that shut the door to Central Hall that saved MPs from being massacred. 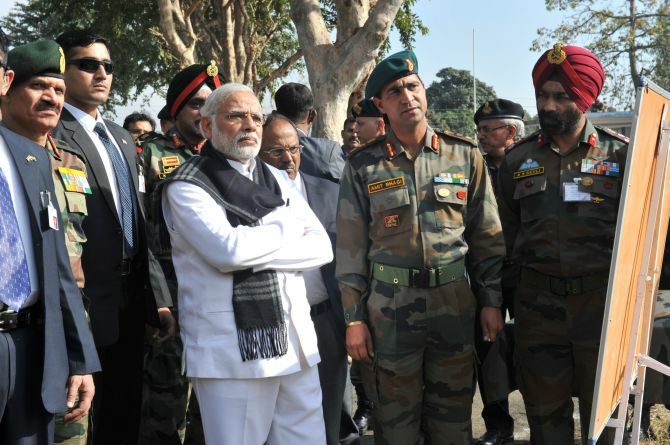 In the Pathankot attack, the brave resistance by the soldiers made sure that the worst was avoided. In both cases it was luck that saved the region and the world from a nuclear conflagration in South Asia. Many recent studies have pointed out that even a limited nuclear war in the Indian subcontinent can be catastrophic for the global environment, which is already under stress. India has tried every possible trick in diplomacy to deal with the Pakistani campaign of terrorism against us, but has failed. We do not understand that the poison of religious extremism, so diligently injected in the Pakistani body politic through the education system in Zia-ul Haq's time, has made the whole society dysfunctional. As the Zia era-educated generation of the 1980s has come of age, this has become the virtual DNA of Pakistan. Last year a senior professor at an American military establishment told me that Pakistani officers of brigadier rank who come to do courses there are totally delusional and live in an artificial bubble of their own. With this as the background and given the fact that Pakistan's approach to India is decided by the army and not the elected government one can imagine why it is so difficult for Pakistan to rein in the terror groups operating on its own soil. It is time the world at large begins to take interest in defusing the situation in the subcontinent. So far the world has virtually 'outsourced' the responsibility for peace in the subcontinent to India. But Indian patience is now running out. Essentially, the crisis is rooted in the fact that Pakistan is a nuclear power. Countries like the United States and China were the prime movers to bring into being this monster. Even Germany is responsible as it supplied the centrifuges to make enriched uranium. Without this international help, Pakistan -- that has a very rudimentary industrial base and technical manpower -- is incapable of going in for nuclear weapons. It is time the world powers responsible for creating this menace atone for their sins. It is time India 'internationalised' the issue of Pakistan-sponsored terrorism since this endangers regional and world peace. It can take up the issue with the United Nations Security Council. India should ask the world body to force Pakistan to act against the terrorist organisations, failing which the UN should impose military and economic sanctions against it. I am well aware with our bitter experience over Kashmir (India took the issue to the UN with a complaint about Pakistani aggression but ended up being at the receiving end). It was Jawaharlal Nehru's naivete that failed to visualise that the West would come to Pakistan's aid due to the prevailing Cold War and Indian non alignment. No wonder we are chary of going to the UN. But the situation is very different today and no country in the world is likely to heed the Pakistani excuse that the terrorism is due to the unsolved Kashmir problem. Terrorism is today a global issue and our repeating the 'mantra' of bilateralism is meaningless. As is most likely with China as a permanent member with a veto, any anti-Pakistan measure is unlikely to get passed. However on the plus side, it will for the first time bring to the world's notice that India has been the oldest victim of cross-border terrorism. I f the UN acts and imposes sanctions on Pakistan, then that country may well come to its senses and actually begin to dismantle terrorist infrastructure. Unlike succumbing to Indian pressure, agreeing to the UN will be less unpalatable. I must share a personal experience to bolster my point. In August 2006, I attended a global workshop on the rule of law and human rights in age of terrorism at Salzburg, Austria. Legal luminaries, judges and human right activists from the world over took part in the deliberations. In the opening session every speaker made a mention of the 9/11 attacks on the US as well as the London and Madrid train bombings. The terror attacks on Mumbai trains a few months before, on July 11, 2006, was totally forgotten. I had to intervene and sarcastically ask if India was located on Mars and why these double standards? In a way we ourselves are responsible for this state of affairs for we have shied away from putting across our case. Like Indira Gandhi did prior to the 1971 Bangladesh war, India must send a special envoy to all the major countries to explain how India has been a victim of cross-border terror. Their task will be easy as almost every terror incident anywhere in world has some linkage with Pakistan. After building up public opinion, India must openly come out in support of Baluchistan and Sindh freedom fighters. If Pakistan refuses to mend its ways, then the break up of Pakistan is the only answer. For the last several years Pakistan has been using fighter jets, tanks and heavy guns against its own people in Waziristan. The civilian casualties this causes have been kept hidden from public view with a very strict censorship. Pakistanis need to remember that Mirzali Khan, commonly known as the Fakir of Ippi, resisted British power successfully from 1936 till independence. He finally died in 1960. The Pakistani army's campaign in Waziristan has given birth to several Faqirs of Ippi-like leaders. In time to come, Pakistan's Punjabi-dominated State will surely come to grief as the British did in the 1940s. What India must do is constantly remind Pakistan of its strategic vulnerability. Its crucial targets and 'heart' that is the Punjab province is a barely 150 km deep strip of land along the Indian border. Virtually every major 'strategic' target of Pakistan is within the range of the Prithvi tactical missile of which India has aplenty. From Mendhar in Jammu and Kashmir, the Kahuta nuclear installations are within the extended range of the Indian artillery's Pinaka rockets. Peace with India is good for Pakistan. If India employs a strategy of a 'thousand cuts', the much smaller and anaemic Pakistan will wither away even without a nuclear war. Colonel Anil A Athale (retd) is a military historian who specialises in counter-insurgency.